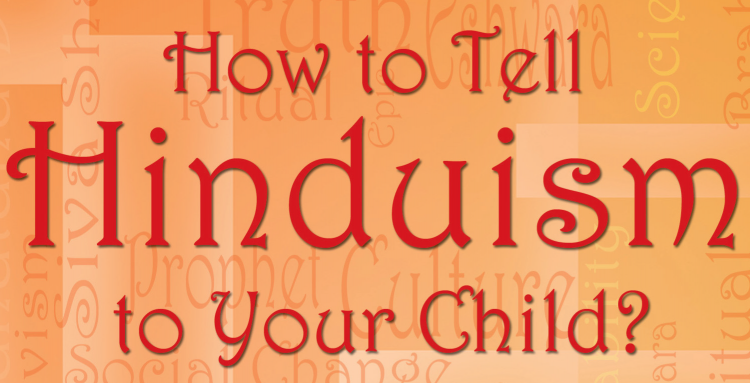 Dr. K. Aravinda Rao, IPS, the author of the book “How to Tell Hinduism to your Child?” holds PhD in Sanskrit. He had a distinguished career in Andhra Pradesh holding a number of positions in the safety and security departments. He was appointed as Director General of State Police in 2010 and retired in 2012. He also worked as the Additional Director General of State Intelligence Department the Additional Commissioner of Police, Hyderabad, Inspector General of Police (Greyhounds) and IGP (Crime Investigation Department). Part 2 (3 & 4 Chapters) will follow next week. I write this book for the parents of today's globalized children. Students of higher classes can read it on their own. The subject is old but it has to be told in modern terms. Perhaps, about fifty years ago, this book was not quite necessary, particularly as we grew up in rural India. We were credulous children, never doubting anything that our parents or grandparents told about gods, heaven, hell and all such stuff. We celebrated all festivals joyously and boisterously, worshiping which ever was the deity concerned. We would worship Sri Rama on the day of Rama Navami, worship the mighty god Shiva on the night of Shiva Ratri or goddess Durga on the day of Durgashtami. It never occurred to us to question why we had different gods and goddesses. We were willing to believe and admire when we were told about the demons slain by Rama or Krishna or Durga. Our childish curiosity was only about which god was more powerful - Whether it is Hanuman or Rama. Whatever answer was given by our elders was quite alright for us. Social change has brought about a great disconnect with the traditional life style, the rituals and festivals associated with them. Our school education is not giving any exposure to the child about religion and parents too are isolated in a working environment. The modern child in India grows in an economically competitive environment without any idea about cultural heritage. This may appear good, because a child will grow up with a scientific, questioning spirit. But as we see around, religion has become a globalized subject like all other aspects of human life and the other religions are seen marketing their religions in an intelligent but aggressive way. This is done at the community level by people who go about telling about their religion, at the level of media through debates questioning several traditional festivals, at the level of films by ridiculing Hindu manners and in a number of other ways. A modern child is unwittingly exposed to all this and he starts doubting whatever little religion he sees at home. There are questions about why we have several gods, as to whether we worship idols and so on. It is a testing time for the parents. They have to update themselves if they have to answer their kids. It is also an unfortunate development that the secular nations of the west are turning to be active defenders and propagators of their religion. This is the result of the conflict between two dominant religions of the world. Sociologists observe that while the 20th century was the century of secularism, the 21st century is emerging as the century of religious revival. The twentieth century saw communism, Maoism, rivalry between communism and capitalism and such ideological issues. This scene has changed and we now see religious extremism and civil wars between religious groups in several countries. Indian children growing abroad do face strange troubles. 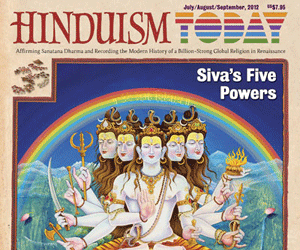 Schools abroad do give some introduction to major world religions, including Hinduism. While other religions can be easily understood and explained in a simple way, Hinduism is found to be difficult because of several religious texts and several traditions of worship. As such, it is likely to be improperly explained. Children sometimes get totally negative impressions by such presentations and sometimes get depressed because of ridicule from peer groups. The parents at home are ill-equipped to handle such challenges. There can be two types of questions on Hinduism. There are primary questions like - 'why do we worship several gods? ', 'are we idol worshippers? ', 'are we asked to do work without expecting the fruit of it? ', 'is everything destined by our karma?' and such type. There can be secondary questions like - 'what is the significance of vermillion or tilak on the forehead? ', 'what do we do hārati or circumambulation in a temple? ', 'what is the significance of the sacred thread?' and such type. In this book I have tried to answer the questions of first type, which are more fundamental and important. The first type can be answered only if we understand the basic philosophy of the Upanishads. The latter type is related to religious practice. Hence a few chapters on philosophy have become inevitable and I apologize to the readers for the difficulty caused. They have to be digested slowly. I will present the basic facts based on the primary texts - the Vedas, the Brahma Sutras and the Bhagavad Gita. This would cover the philosophical queries. All other books such as purāna-s, Mahabharata and Ramayana are secondary texts, based on the philosophy of the primary texts. These relate to religious practices, rituals, festivals and ethical life. I have also explained certain social issues like caste and untouchability. You may not straight away start teaching the contents of the book, but may wait for the query from your child. The children are bound to ask the questions discussed in this book. It will be good to tell them when they do ask about it. Chapter - 2 : Who are Hindus? A commonly accepted derivation for the word 'Hindu' is like this. The ancient Persians, in their texts, referred to the river Sindhu as 'Hindu', as it was their way of pronouncing the sound 's'. They also referred to the people who lived around the river as Hindus. This name was adopted by various others who came to India either as invaders or visitors and the name got attached to us. This word is not in the Vedas or major purāna-s. Some scholars do say that the word 'Hindu' is found in the purāna-s and also give a derivation, but this is debated. It is estimated that nearly one-seventh of the world's population are Hindus, who are followers of the most ancient religion alive today. It is the fourth largest religion in the world after Christianity, Islam and Buddhism. Both Buddhism and Hinduism originated in India, but Buddhism spread to China and other South Asian countries, while Hinduism is now mostly confined to India, though at one time it had spread to other countries too. The real word for Hinduism is 'sanātana dharma'. 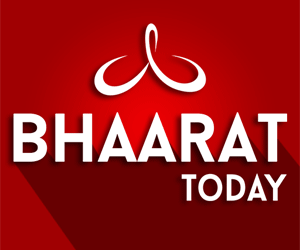 This was the word used to denote the religion and culture before the British popularized the word 'Hindu'. 'Sanātana' is that which is permanent in nature and 'dharma' is that which holds the society together. It means the code of conduct which holds for all times for social harmony and integration. Religion and religious rituals were part and parcel of this dharma. Sometimes it is said that Hinduism is not a religion but a way of life. It means that Hinduism is not like other religions. In other religions, there is only one book and one belief system about god, heaven and the devil. Hinduism has a number of belief systems under the umbrella of one single philosophy, as we shall see in great detail. If you look at the map of the present day India, Himalayas are in the north-east, bordering China. Pakistan is on the north- west. At the time of origin of what we call Hinduism, the name of the country was 'Bharata-varsha', covering areas right up to the present day Afghanistan on the north-west and up to Myanmar in the east. The sister of the King of Kandahar (Gandhara) was the grand old lady Gandhari, the mother of the hundred Kauravas whom we see in the great Indian epic Mahabharata. All this land from Afghanistan to Kerala was the land of sanātana dharma. We had very friendly relationship with another mighty empire of olden days, that is, China. A large contingent of Chinese soldiers, a golden sea of people, fought on the side of the Kauravas in the epic battle of Mahabharata. gaṅge ca yamune caiva godāvari sarasvati . narmade sindhu kāveri jalesmin sannidhimkuru .. This is recited by all those who do their daily prayers anywhere in the country. It is an invocation to all the rivers of the country invoking their holy waters into the chalice. The prayers also refer to the whole of Bharata-varsha. We do pilgrimage to the twelve famous shrines of Shiva (Jyotirlingas), the eighteen shrines of Shakti (śakti-pīthas) wherever we may reside. Even an unlettered Indian, located anywhere in the country, would owe allegiance to all these shrines, which have become part of the Indian psyche. One has to listen to the mahāsaṅkalpam (a long hymn to our mother land) which is recited at the time of marriage, in order to understand the glorious vision of our country. Mahabharata and Ramayana contain several descriptions of the geography of Bharata-varsha, as it was then called. There are details of several small kingdoms and their geographical details. Mahabharata describes the kings who took part on behalf of Kauravas or Pandavas in the war. Sanskrit abounds in such description of kingdoms. All these underline the cultural oneness of India. The cultural unity of all tribes with the mainstream population has also to be noted. The great epic Mahabharata describes how the five exiled princes stayed with the tribes and took their help while staying in the forest. Yudhishtira sends them as spies to observe the governance by Duryodhana. Similarly, Ramayana describes how the chiefs of several tribes were invited on the eve of proposed coronation of Rama. Later, when Rama was in exile, he moved with the chiefs of tribes and took their help. There is a famous episode in which Rama held discussion on dharma with Sabari, a tribe's woman. All this shows that the tribes were an integral part of Indian culture. Prof. Stephen Knapp notes how Indian culture spread to several East-Asian countries because of its sheer greatness of culture and not by military might. Extensive research has been done by him about how merchants were responsible for the spread of Hinduism in Cambodia, Thailand, Malaysia and such countries. The languages and diction of these countries bear testimony to the cultural connections.